This is gorgeous. I'm keeping this in mind for inspiration when the time comes to start my Christmas cards! Great idea to use the foliage dies with the ornament! Your card caught my eye immediately. It's stunning with the different greens and yellows. They just make the red ornament pop! Thanks for sharing your Christmas card with everyone at the Casual Fridays Challenge. OMG, your card is superb!!! Love it! 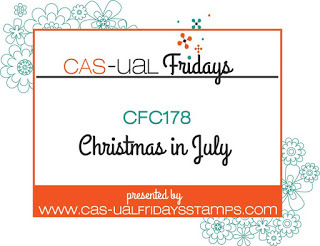 Thanks for joining our Christmas in July here at CASual Fridays! This is absolutely gorgeous! I love the coloring and how you used all those dies! Thanks for playing our CAS-ual Fridays challenge!